The Graz Model for Integrative Development was created by Clemens Mader in his dissertation project* and has been further improved since and is currently applied for various (sustainability-) processes. 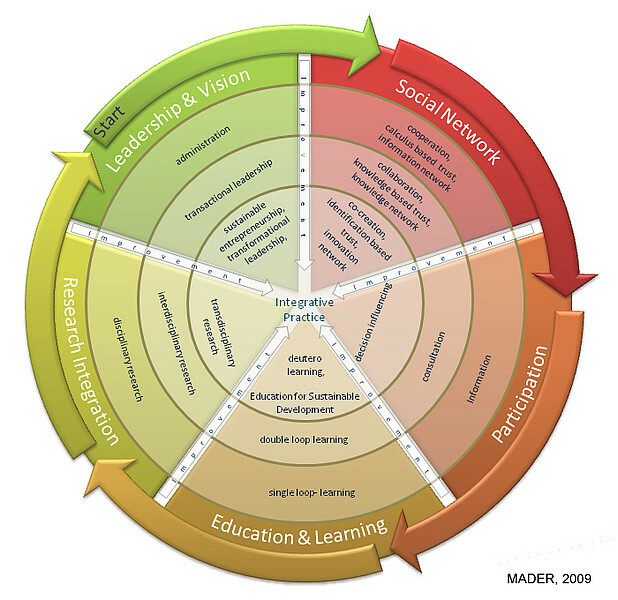 The Graz Model for Integrative Development describes development processes on the basis of five principles: leadership & vision, social network, participation, education & learning, and research integration. The model aims to scientifically reflect and evaluate sustainability processes as well as to provide support in the planning and further development of these processes. Based on the Graz Model, development processes can be monitored from the vision to the implementation. The five principles of the Graz Model for Integrative Development can be determined in all development processes. The model further divides each principle into three levels, which enables the analysis of the principles in applied processes. The user can draw conclusions for future developments. Users are from business (corporate processes), NGOs (social and environmental processes) or regional organizations (regional development processes). 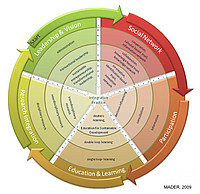 Integrative development is manifested by blurring of the individual principles and its intensity increases towards 'the center' of the model (Mader et al., 2011). 1. Leadership & Vision describes the actions of executives. Responsible leadership can be seen as a prerequisite for a successful implementation of sustainability processes. 'Transformational leadership' further develops this process in cooperation with the stakeholders. 1st level: Administration: Administration-oriented leaders complete tasks that are initiated by other people. Their own vision is not implemented or developed. 2nd level: Transactional Leadership: Transactional leaders pass leadership to associates. However, the strategic policy and vision are defined by the transactional leader. 3rd level: Transformational Leadership: In transformational leadership, the management shares its vision and works on its vision in cooperation with the stakeholders. Responsibilities and leadership are shared among involved stakeholders. This may be achieved by means of intellectual and creative ideas (education, research, art), development of innovation, respect and trust between the social network and people concerned. 2. Social Network: involves the active people concerned. Two factors define the level of the network—the form of cooperation and the intensity of trust. 1st level: Information Network: Information networks are the most basic type of social networks. They are based on the exchange of information. The actors of the information network do not share a common objective (e.g. library). 2nd level: Knowledge Network: Knowledge networks not only exchange information but also seek development and collaboration (Kogut et al. 1993). They are based on mutual trust and collaboration, which implies the development of common ideas and active participation (e.g. Wikipedia). 3rd level: Innovation Network: An innovation network is based on a shared vision and identification-based trust. Shared learning and development processes (Senge 1990) focus on solving problems and are based on participation and creative co-creation. Innovation is the primary goal of innovation networks and is a result of transformational leadership. 3. Participation describes how people as part of a social network become involved in the process. People of the social network can for example be informed, consulted, or take part in decision making processes. 1st level: Information: Information, as the lowest level of participation, makes processes transparent. People are informed about the process but they do not have the possibility to give feedback. 2nd level: Consultation: On this level, parties concerned have the possibility to give feedback and contribute their experience in an organized way (e.g. surveys, online forums, etc.) Decision makers can consider the opinion of these parties before continuing with the decision making process. 3rd level: Decision Influencing: At the highest level of participation, the parties concerned can take an active part in the process and their opinion has to be taken into account. At this level of participation, innovation networks can be formed. 4. Education and Learning: This principle tries to find out how best to integrate education and professional training in sustainability processes. Additionally, the people involved spend some thought on how the whole process is reflected, what conclusions can be drawn and how the vision might have to be changed. 1st level: Single-Loop Learning: In single-loop learning processes, people rethink only their actions, which then have implications for the results but not for the initial aims. Therefore, the results of the learning process are limited to the initial aims. 2nd level: Double-Loop Learning: People not only rethink their action but also their aims. Routines are reviewed and new ways to achieve the aims are taken into consideration. 3rd level: Deutero Learning describes processes in which people 'learn how to learn'. Learners in such processes not only reflect on the aim but also rethink and improve the process itself. The organizational capacity of the learning processes is increased and innovations are created. 5. Research integration plays a fundamental role in innovation for sustainability processes. Interdisciplinarity takes different perspectives (disciplines) into account, transdisciplinarity actively integrates people concerned by the research process. 1st level: Disciplinary Research: Processes are focused on only one subject area. Results of disciplinary research can provide a basis for interdisciplinary research. 2nd level: Interdisciplinary Research focuses on the impact that different subject areas have on each other and studies the effects. To assess tasks of sustainable development, an interdisciplinary approach that reflects and relates social, ecologic and economic aspects to each other is necessary. 3rd level: Transdisciplinary Research addresses issues that are relevant for society and works on these issues in cooperation with the actors and stakeholders concerned. A mutual learning process is generated by joint research and development of visions. Interdisciplinary scientific and social groups are involved in order to take the multitude of factors that can influence the addressed issues into account (Scholz & Tietje 2002). *MADER, C., 2009: Principles for Integrative Development Processes towards Sustainability in Regions.- Universität Graz, 140 S.